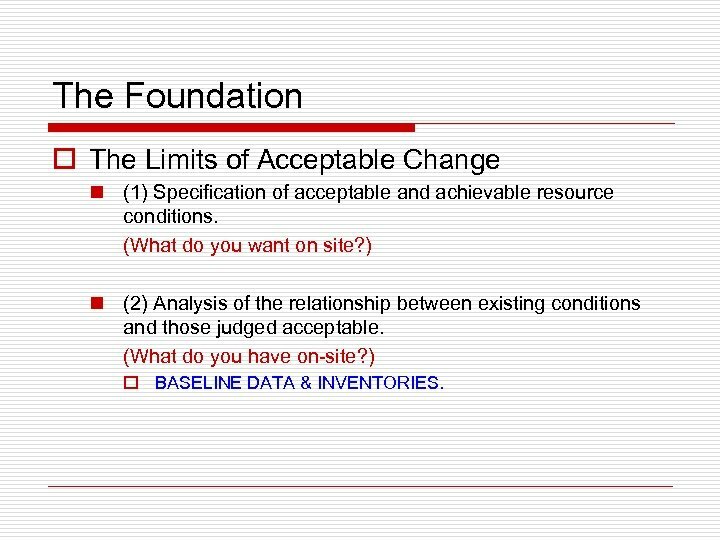 The Foundation o The Limits of Acceptable Change n (1) Specification of acceptable and achievable resource conditions. (What do you want on site? ) n (2) Analysis of the relationship between existing conditions and those judged acceptable. (What do you have on-site? ) 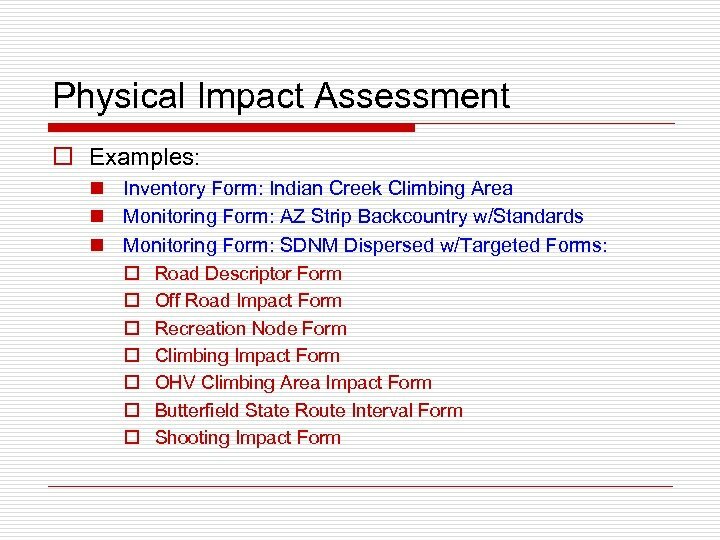 o BASELINE DATA & INVENTORIES. 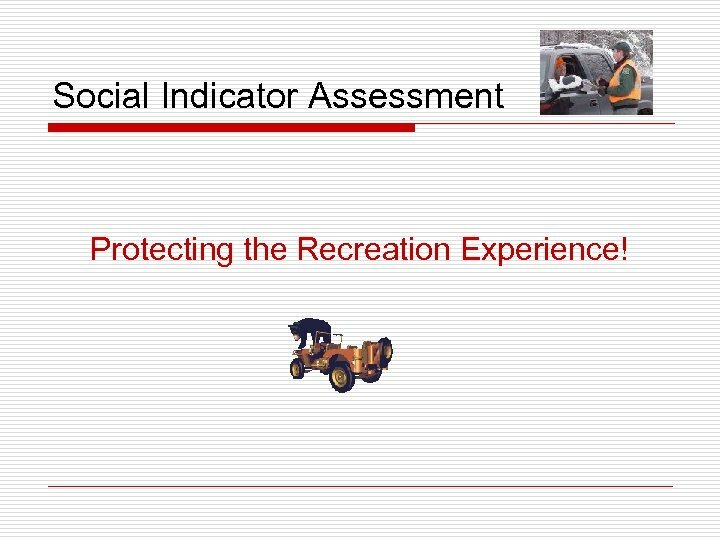 Social Indicator Assessment Protecting the Recreation Experience! 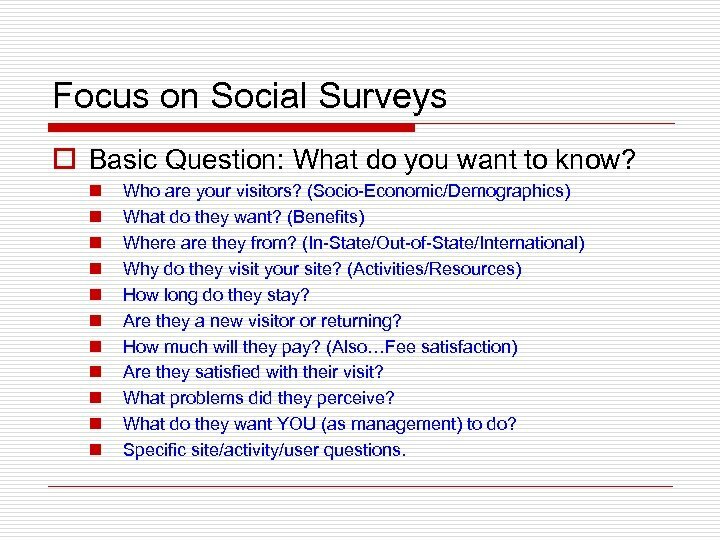 Focus on Social Surveys o Basic Question: What do you want to know? n n n Who are your visitors? (Socio-Economic/Demographics) What do they want? (Benefits) Where are they from? (In-State/Out-of-State/International) Why do they visit your site? (Activities/Resources) How long do they stay? Are they a new visitor or returning? How much will they pay? 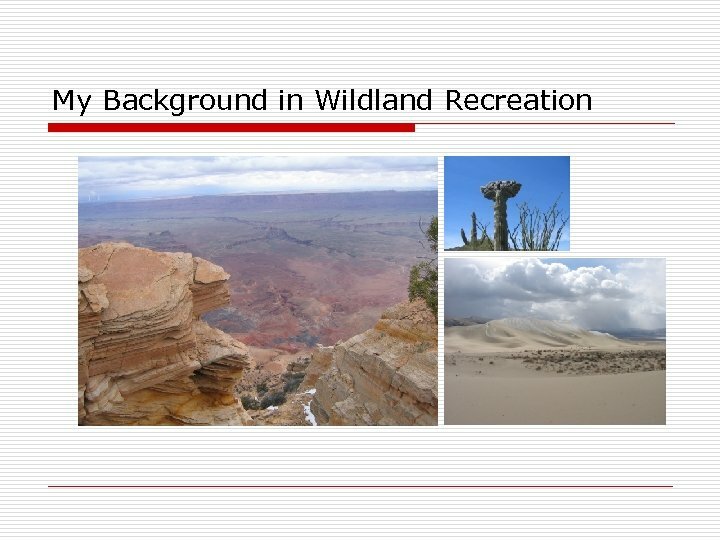 (Also…Fee satisfaction) Are they satisfied with their visit? What problems did they perceive? What do they want YOU (as management) to do? 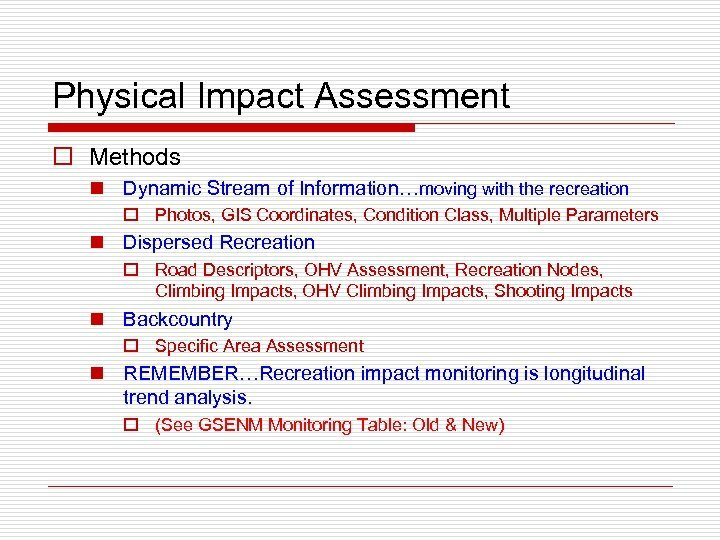 Specific site/activity/user questions. 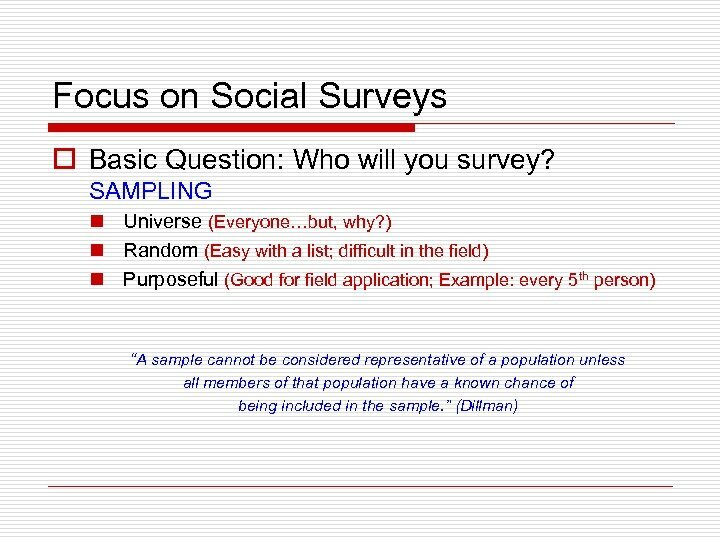 Focus on Social Surveys o Basic Question: What population do you want to survey? 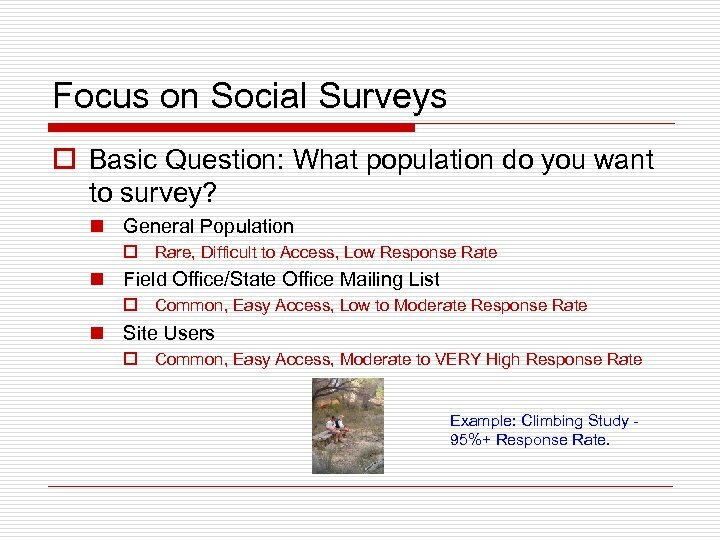 n General Population o Rare, Difficult to Access, Low Response Rate n Field Office/State Office Mailing List o Common, Easy Access, Low to Moderate Response Rate n Site Users o Common, Easy Access, Moderate to VERY High Response Rate Example: Climbing Study 95%+ Response Rate. 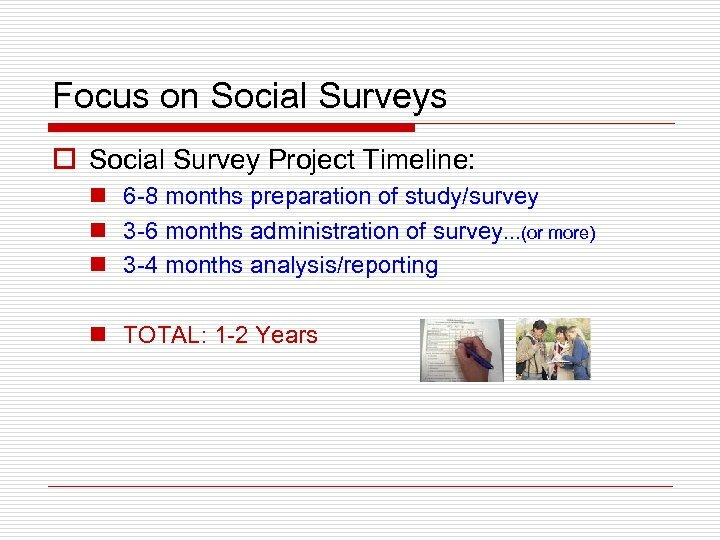 Focus on Social Surveys o Costs: n Extremely Variable! 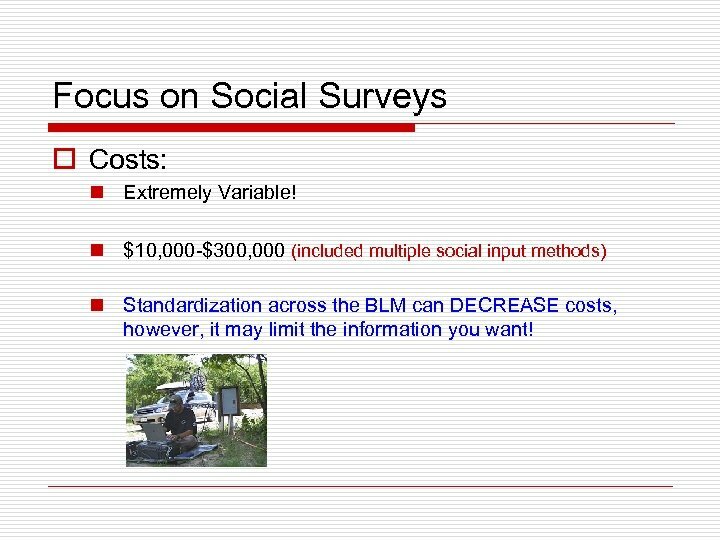 n $10, 000 -$300, 000 (included multiple social input methods) n Standardization across the BLM can DECREASE costs, however, it may limit the information you want! 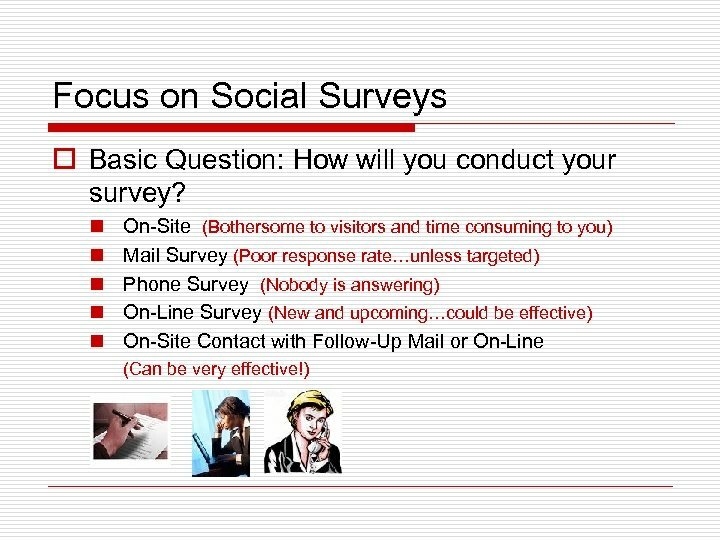 Focus on Social Surveys o What to AVOID: n A survey in newspapers or newsletters where an individual can submit multiple responses. 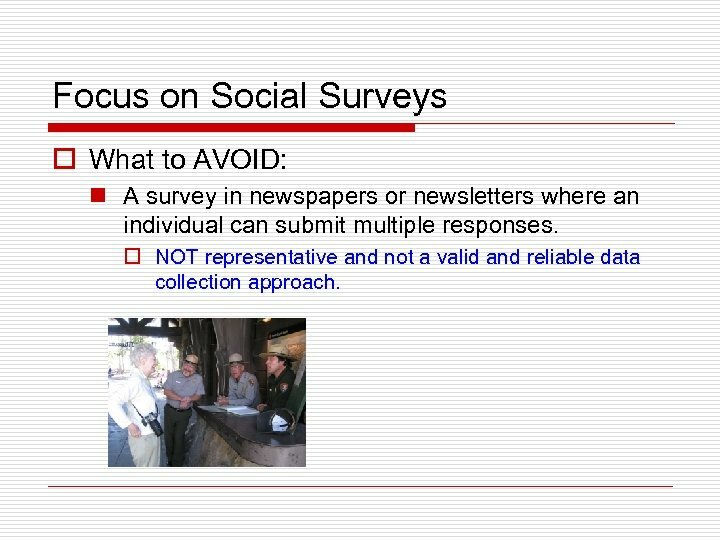 o NOT representative and not a valid and reliable data collection approach. 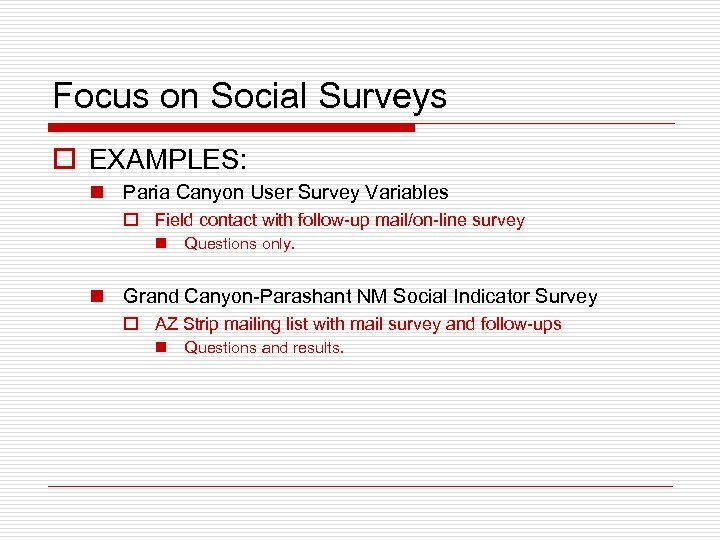 Focus on Social Surveys o EXAMPLES: n Paria Canyon User Survey Variables o Field contact with follow-up mail/on-line survey n Questions only. 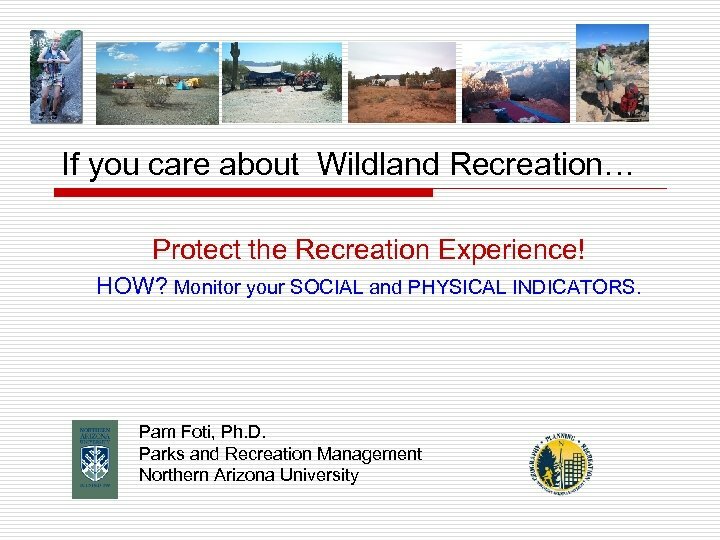 n Grand Canyon-Parashant NM Social Indicator Survey o AZ Strip mailing list with mail survey and follow-ups n Questions and results. 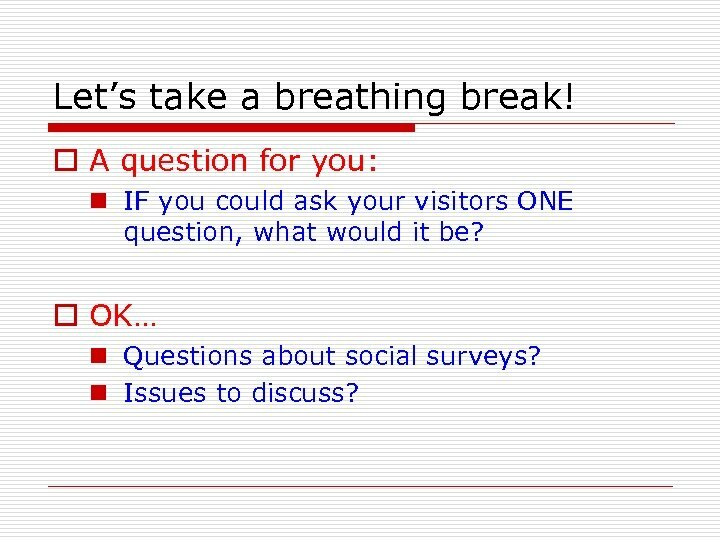 Let’s take a breathing break! o A question for you: n IF you could ask your visitors ONE question, what would it be? 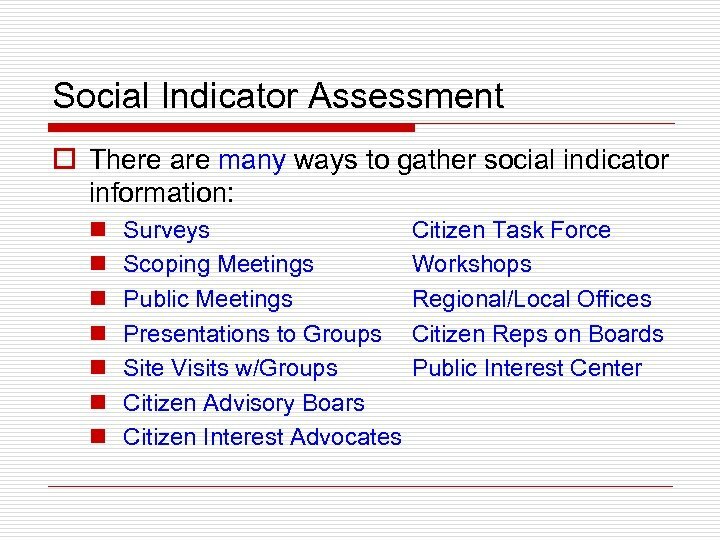 o OK… n Questions about social surveys? n Issues to discuss? 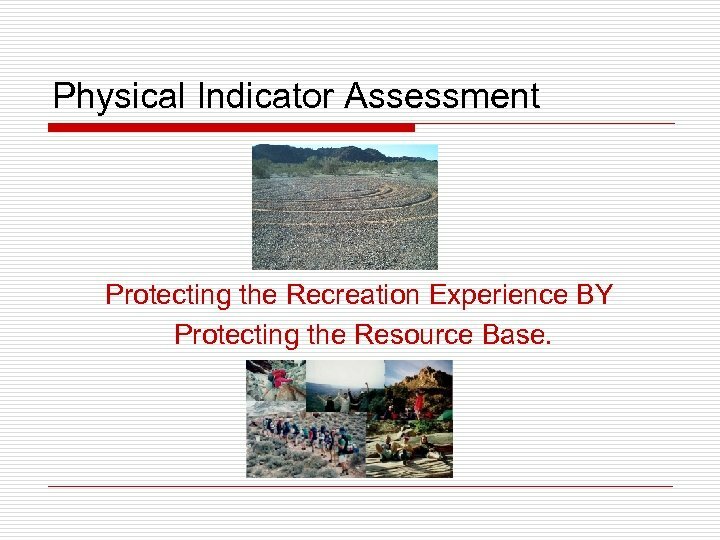 Physical Indicator Assessment Protecting the Recreation Experience BY Protecting the Resource Base. 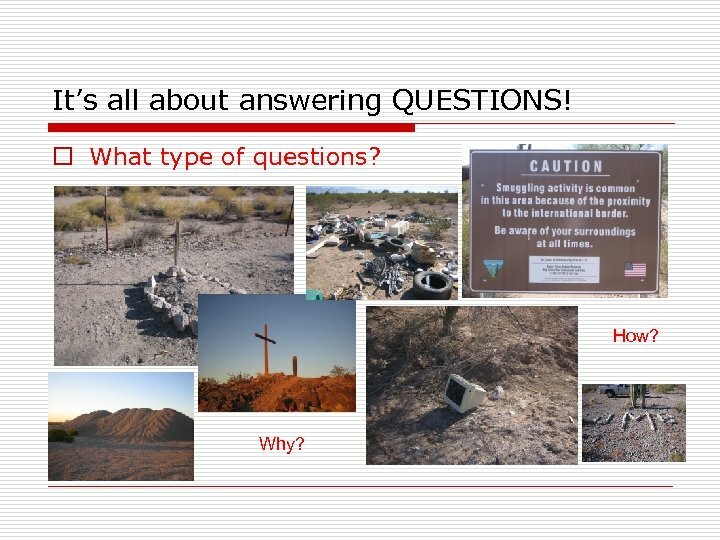 It’s all about answering QUESTIONS! o What type of questions? How? Why? 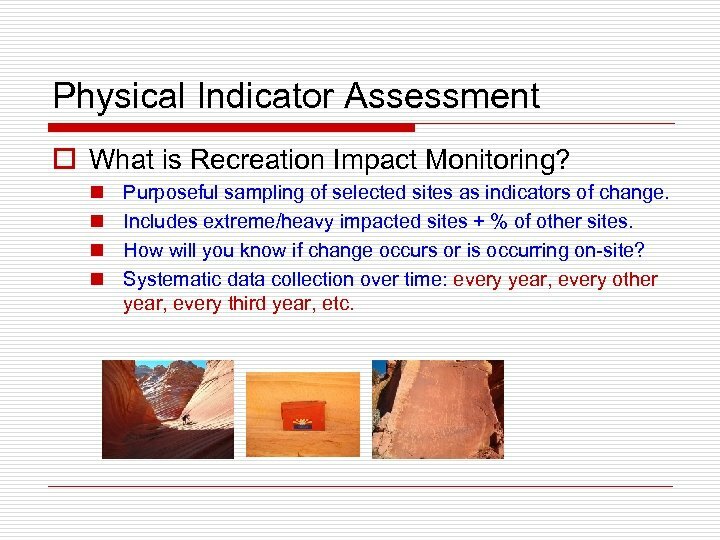 Physical Indicator Assessment o What is a Recreation Impact Inventory? 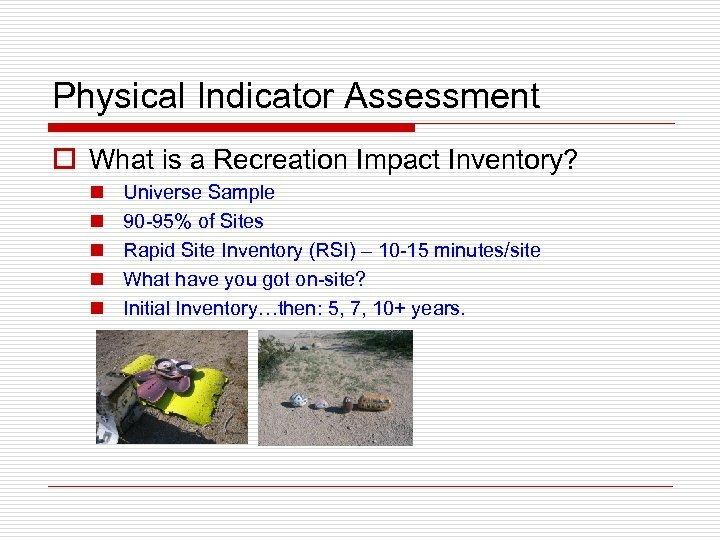 n n n Universe Sample 90 -95% of Sites Rapid Site Inventory (RSI) – 10 -15 minutes/site What have you got on-site? Initial Inventory…then: 5, 7, 10+ years. 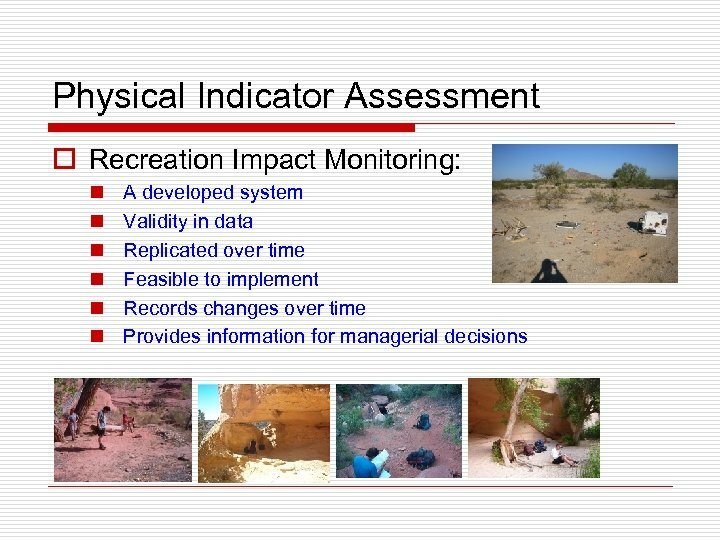 Physical Indicator Assessment o What is Recreation Impact Monitoring? 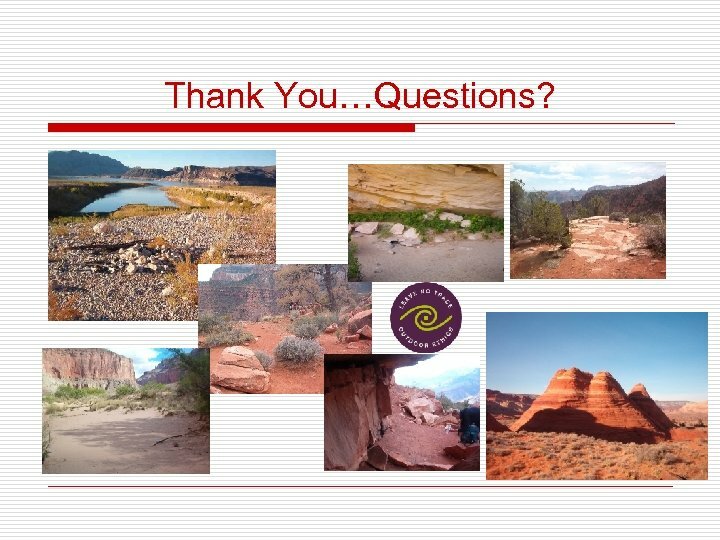 n n Purposeful sampling of selected sites as indicators of change. 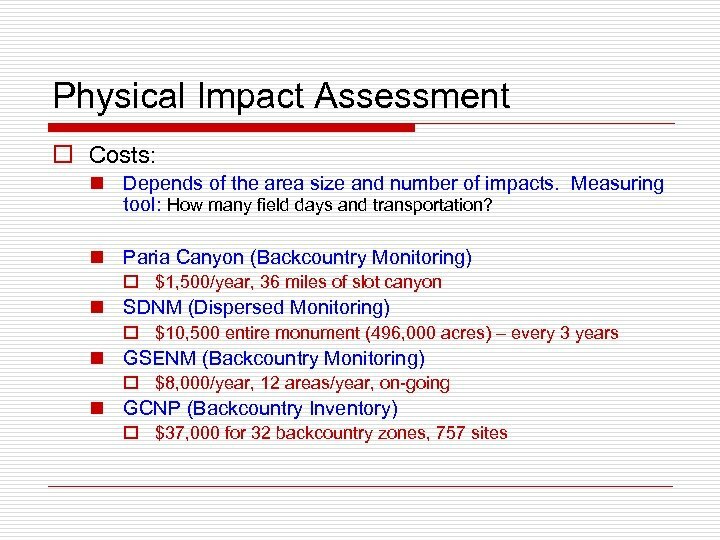 Includes extreme/heavy impacted sites + % of other sites. 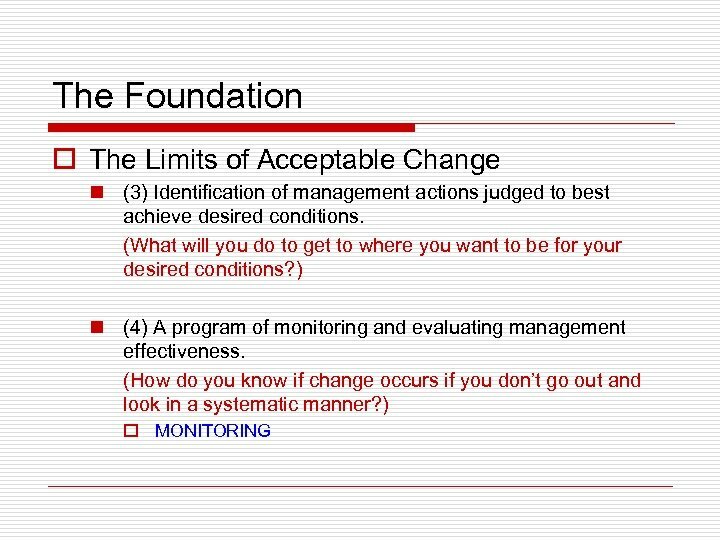 How will you know if change occurs or is occurring on-site? 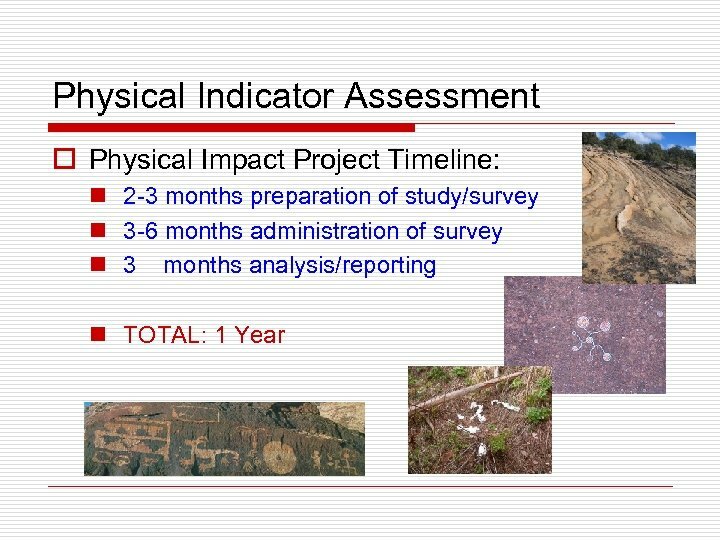 Systematic data collection over time: every year, every other year, every third year, etc. 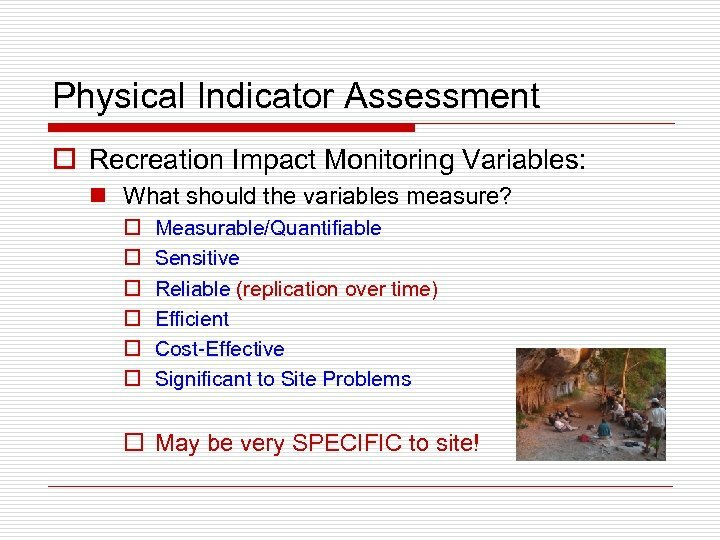 Physical Indicator Assessment o Recreation Impact Monitoring Variables: n What should the variables measure? 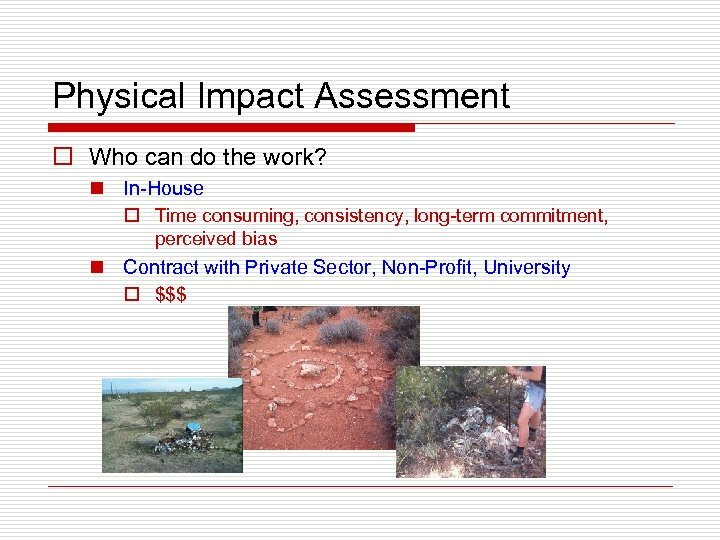 o o o Measurable/Quantifiable Sensitive Reliable (replication over time) Efficient Cost-Effective Significant to Site Problems o May be very SPECIFIC to site! 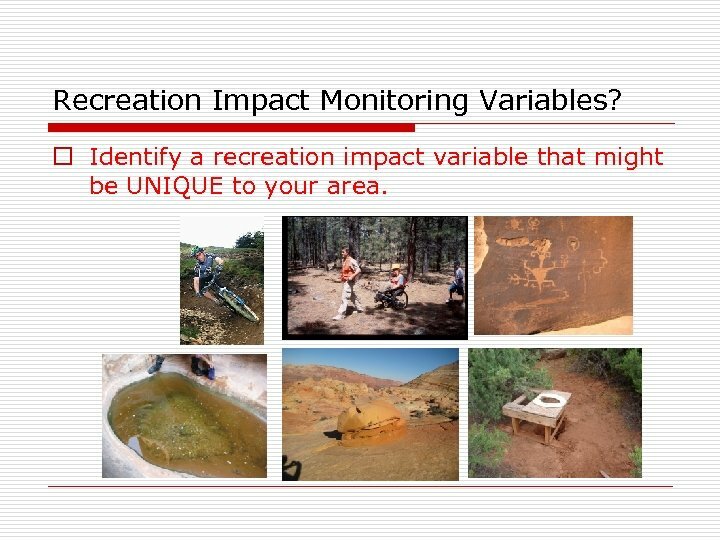 Recreation Impact Monitoring Variables? 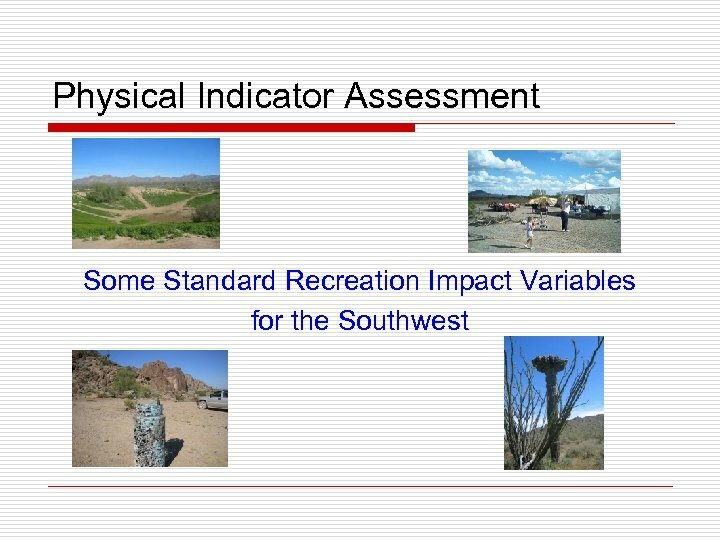 o Identify a recreation impact variable that might be UNIQUE to your area. 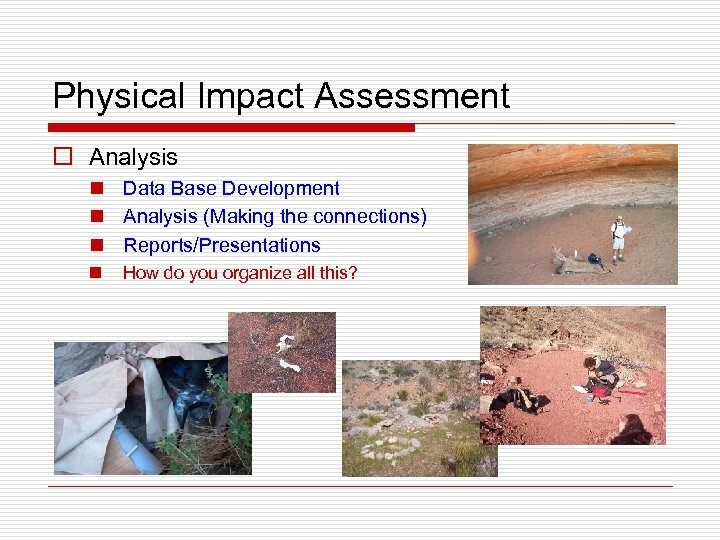 Physical Impact Assessment o Analysis n Data Base Development n Analysis (Making the connections) n Reports/Presentations n How do you organize all this? 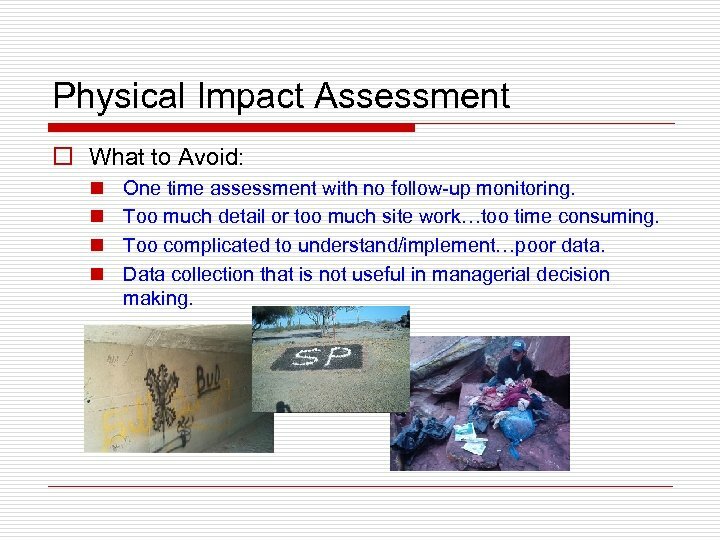 Physical Impact Assessment o What to Avoid: n n One time assessment with no follow-up monitoring. Too much detail or too much site work…too time consuming. 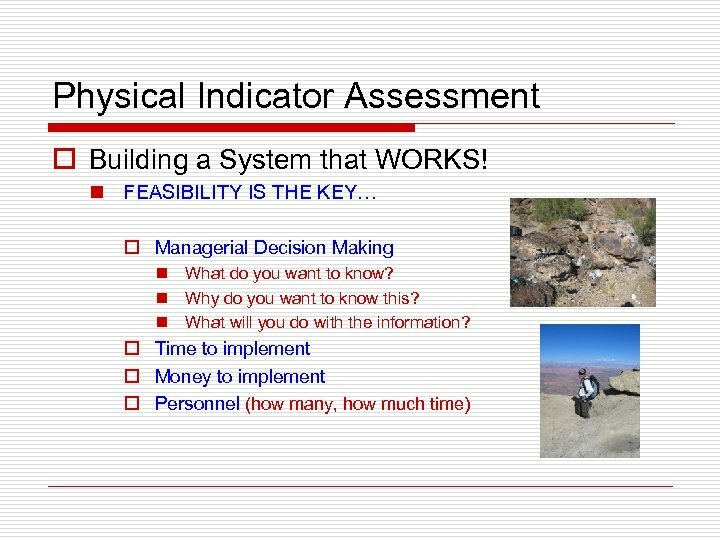 Too complicated to understand/implement…poor data. 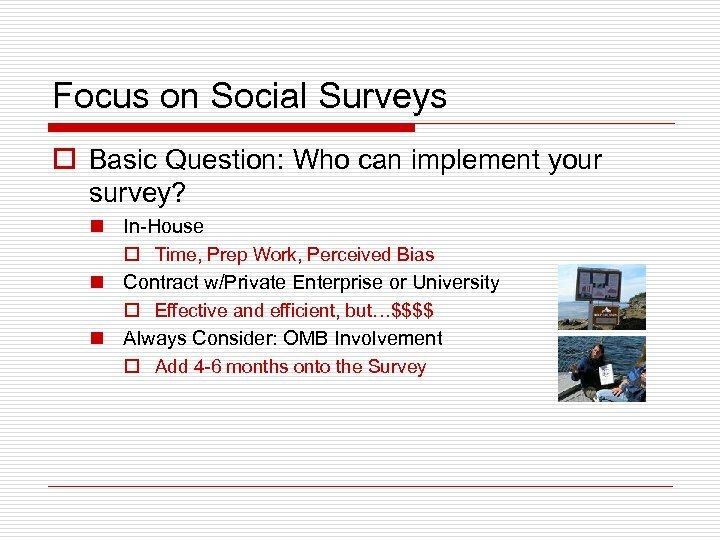 Data collection that is not useful in managerial decision making.